Ever feel the need to unwind after work — literally? 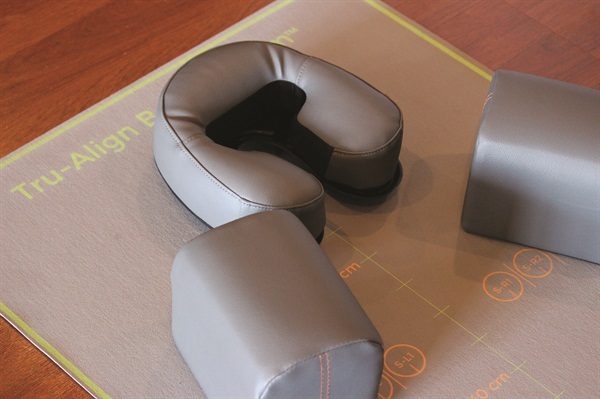 The Tru-Align Body System from Kacelia can be used for 20 minutes at the end of your workday to ease back and neck pain and correct posture and alignment. “Nail technicians are at high risk of developing health-threatening postural defects because of the unhealthy positions they must work in. Those who perform pedicures are even more affected,” says chiropractor Evelyn Zuehlke-Haworth, who created the Tru-Align along with her husband Kelly Haworth. Whether you are currently experiencing aches and pains or just want to be proactive, this at-home self-care treatment system may offer relief. The user sets up the system after viewing a short instructional video online, then lies face down with her body supported at key points. Gravity then does the work of exerting gentle downward pressure, encouraging the sacroiliac, spinal, shoulder, and TMJ joints to stretch and shape. The upholstered cushions, bolsters, and face cushion are handcrafted to form to the user’s body. “Using the system allows nail professionals to undo what performing their art has done to their bodies,” says Zuehlke-Haworth. For more information, go to www.kacelia.com. NAILS readers will receive a $100 discount by using the special discount code NAILSMAG14. Or go to www.nailsmag.com/freebies by December 31, 2014, and enter to win a free Tru-Align Body System.